A Range Rover car was almost entirely destroyed by fire in an incident at Ab Kettleby this afternoon (Friday). Two fire crews from Melton Fire Station attended the scene in Clawson Road after it was reported at 12.39pm. 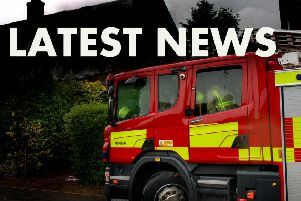 Leicestershire Fire and Rescue Service said the vehicle suffered 90 per cent fire damage and the blaze was believed to have started accidentally as a result of mechanical breakdown. A spokesperson said: “We received a call about a car fire involving a Range Rover. “One appliance from Melton was initially mobilised and, upon arrival, a message was received requesting a second appliance.